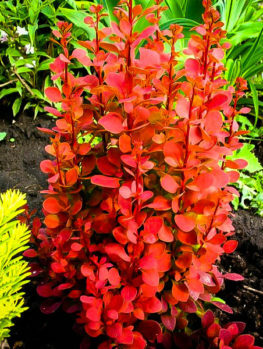 The Crimson Pygmy Japanese Barberry is a fantastic foliage plant for any garden. 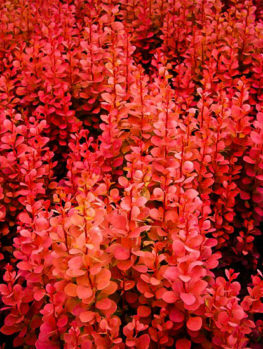 It has leaves of a solid purple-red color that really bring richness to your planting. 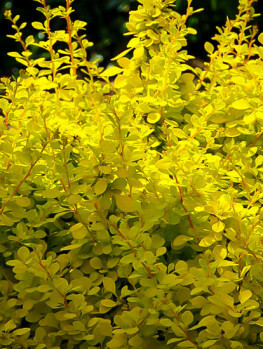 Use it for all-season color effects with other shrubs and flowers, and this is such a tough plant that it needs no special care to thrive almost anywhere. Use it in groups to fill areas of the foundation plantings around your house, or plant it in the front of larger shrubs. It is compact enough to use in large pots and planter boxes too, to make a low boundary hedge along a drive, or to separate one part of your garden from another. 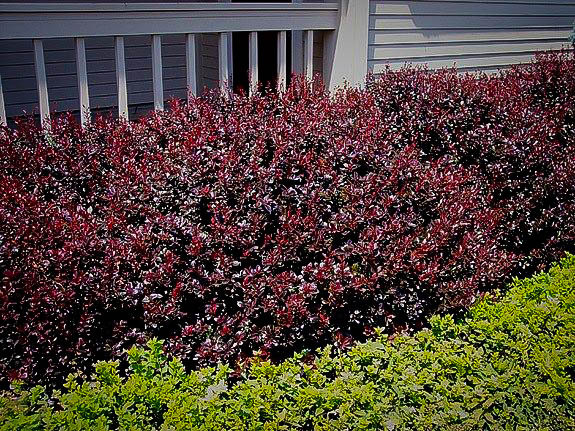 From spring to fall you will love the dense, rich color of this shrub and how it makes your garden beds look so much more exciting. 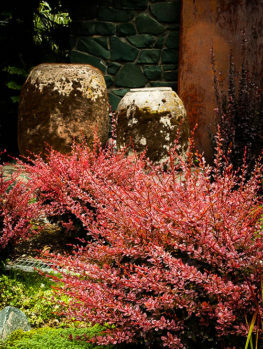 Plant your Crimson Pygmy Japanese Barberry in a sunny or partially-shaded spot in any kind of soil, from sand to clay. 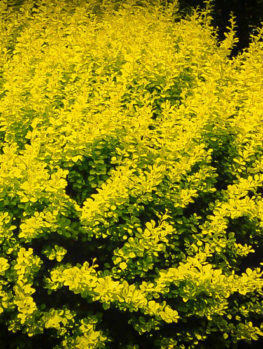 Once established it is drought-resistant, free of pests and diseases and even deer-proof. It is also hardy to minus 30 degrees, so in colder areas this is a great way to add rich color from spring to fall, without the chore of planting flowers every year. Used with other colored foliage plants it will really help you create a rich, exciting garden picture with no effort at all. Flowers are always nice, but plants have to earn their keep in the garden even when they are out of flower. Although it is always good to have plenty of calming green leaves in the garden, lots of plants are valuable for their foliage color, and an always-popular color is purple to red. The Crimson Pygmy Japanese Barberry is a great plant to bring strong and vibrant deep red foliage into your garden with a low-maintenance, tough and trouble-free plant. A plant that is the perfect size for any garden too, growing to no more than 3 feet in height and 3 to 4 feet wide. 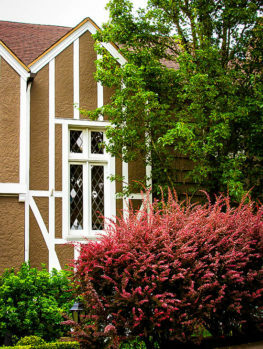 Once established, the Crimson Pygmy Barberry is drought-resistant and thrives in almost any kind of soil. Japanese barberry (Berberis thunbergii) is native to Japan and China. It was introduced into America in 1875 at the Arnold Arboretum in Boston, and quickly became a popular garden shrub. 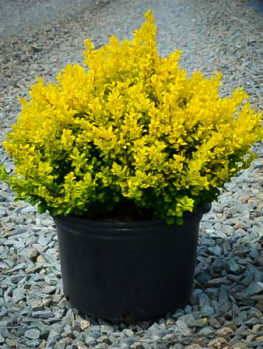 There are a number of forms with colored foliage, like the Dwarf Golden Japanese Barberry, with beautiful golden-yellow leaves. The first purple-leaf forms were produced in France at the beginning of the 20th century, and the Crimson Pygmy form was developed in 1942, by the Van Eyck Nursery, in the famous plant-growing area of Boskoop, Holland. Since then this plant has been carefully produced from stem pieces, not from seed, to preserve its exact dwarf properties and rich foliage color. Avoid cheaper seedling plants that will be much too large and will also have inferior leaf color. 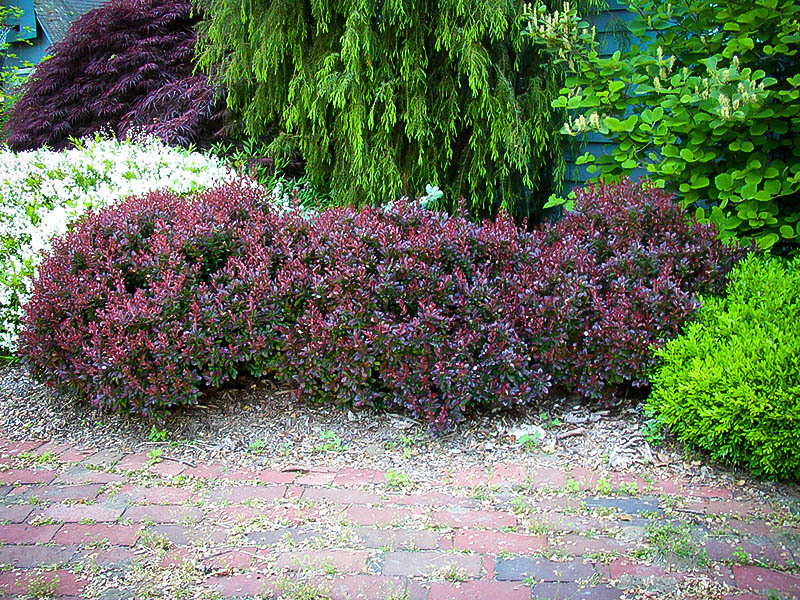 You can plant the Crimson Pygmy Japanese Barberry in groups of one, two, three, five or more plants, to make an attractive mass of color among your other shrubs. It can become an important part of your foundation planting around the house, giving color and interest without being too tall and blocking windows. You can use it in a similar way among shrubs and flowers in your garden beds, or plant it among boulders and gravel where its bright color will look great against the grey or sandy colors of stone. It also makes a terrific low barrier planting, or as an edging along a driveway, or to define a large bed. 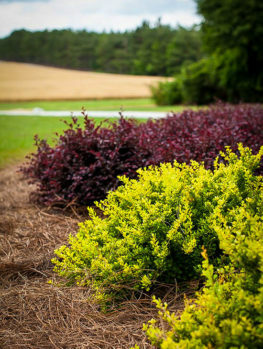 If you have beds where you regularly plant annual flowers, use one or more Crimson Pygmy Japanese Barberry as permanent center-piece plants in the beds. You will have a great color for the flowers to contrast with and you will reduce the number of annuals you need to buy, saving yourself lots of money in the long run. The Crimson Pygmy Japanese Barberry is a deciduous shrub growing just 2 to 3 feet tall and 3 to 4 feet wide, with a dense, twiggy structure right to the ground. Each stem is covered with masses of small, rounded leaves, in a deep, rich shade of purple-red. The leaves are in clusters along the stem, not spaced individually, which makes for a denser look, even on a small plant. At the base of each leaf cluster is a sharp spine, so be a little careful handling this plant and don’t put it where you are constantly brushing past it. In spring there may be hanging clusters of yellow flowers, which are attractive, and in fall you may see some clusters of edible red berries, but this variety of barberry does not produce many berries, so it is also not likely to escape into the surrounding area and become a problem to your local ecosystem. In fall the leaves become attractive shades of scarlet and orange before falling. The twiggy structure of the plant, and its ridged bark, also makes it attractive in a quiet way during the winter months. 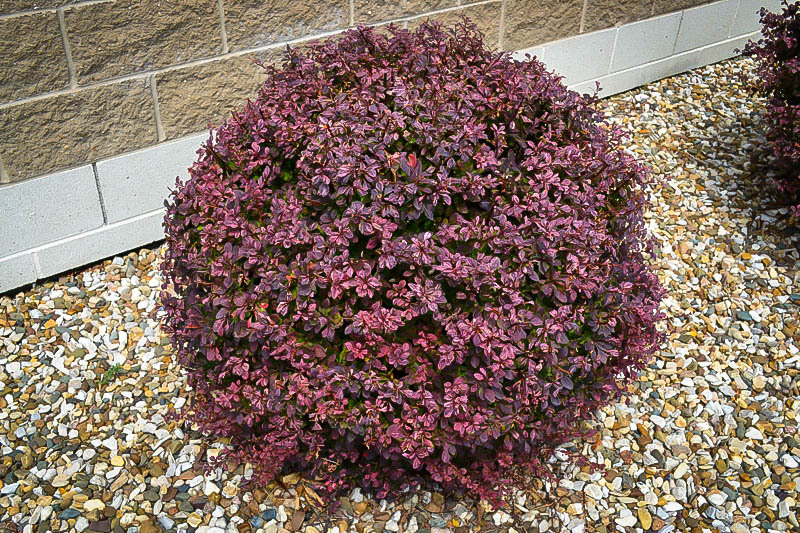 You can plant the Crimson Pygmy Japanese Barberry in a sunny location, or in partial shade. In deeper shade the foliage will not be as strongly colored, although the plant will still grow well. It is hardy to minus 30 degrees and it will grow in any kind of soil, from sandy soils to heavy clay, although it does not do so well in wet soils. Established plants are drought resistant and there are no significant pests or diseases, so this is a great low-maintenance plant if you want an attractive garden but don’t have time to do a lot of chores in it. You don’t even need to clip this plant, as it will naturally grow densely, but it can be clipped in any season to form a hedge, or if you want to keep it shaped into a neater ball. The spiny nature of the Crimson Pygmy Japanese Barberry might make it sound unattractive, but actually it is useful, as the spines make this plant deer proof. You can also plant a screen of these shrubs as a great way to prevent other animals, like cats, from entering your property. Additionally, it makes intruders less likely to try to enter your house if there are spiny bushes below the windows. However you decide to use this versatile plant in your garden, you will always enjoy seeing its bright leaves, and love how it brings color so easily to your garden all through the season. This is such a useful plant that no garden should be without it as the backbone of the planting of your beds. Because it is so useful, the demand is always high, so order now to avoid disappointment and bring cheerful color to your garden all season long.